Issue 4 of Kult magazine features 50 international artists' vision of Fortune. 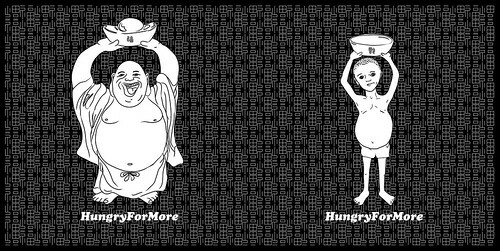 Our illustration takes on the Chinese's insatiable appetite for more of everything. Huat ah! It contrasts two large bellies, one a symbol of plenty and the other of lack. The smiling buddha holds up a gold ingot to bless those hungry for more wealth, and the hungry child an empty bowl.